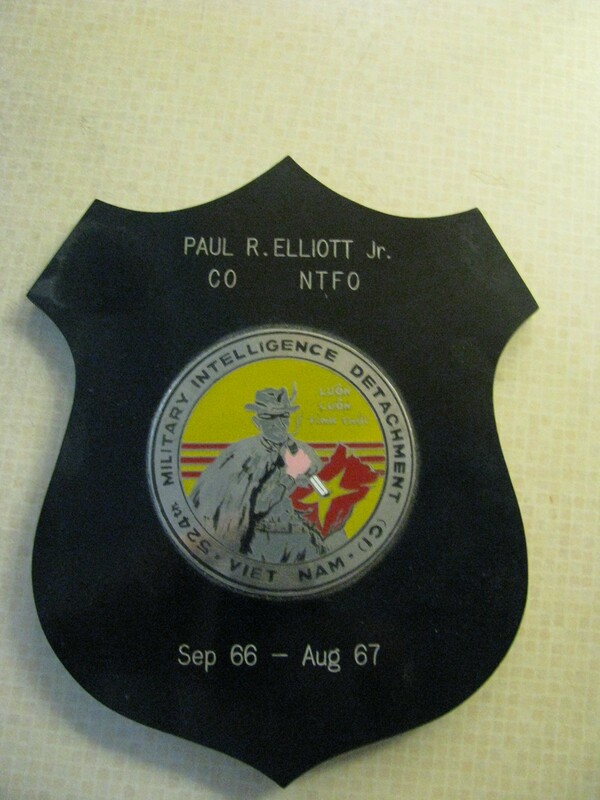 Paul Elliott was trained as a Russian linguist and military intelligence agent and when he went to Vietnam in 1966. He had to use those skills and more to ferret out saboteurs trying to sneak into Camp McDermott — the main supply base for the 1st Logistical Command that provided American forces with most of their equipment during the war. Elliott commanded a seven-man unit. His outfit was part of the 524th Military Intelligence Detachment headquartered in Saigon. Camp McDermott was just south of Nha Trang. The camp was a couple square miles loaded down with military equipment and supplies piled high on pallets. Elliott’s job was to run security checks on the 4,200 Vietnamese workers on base. At the same time, he kept his ear to the ground trying to learn what plans the Viet Cong and North Vietnamese Army might have for an attack on the base. “I was befriended by an old CIA agent named Leo Fraenkel who was working out of his headquarters in Nha Trang. He had probably worked for every intelligence agency in the world,” Elliott said. “He was the only guy over there who really seemed to have his finger on the pulse of what was happening. He also had enough agents in the field so he knew about pending enemy attacks before they happened. “He taught me that the VC and the NVA were meticulous planners. Before they mounted an operation, they would put the whole thing on a sand table and rehearse every move. To throw them off stride, the only thing you had to do was change something,” Elliott said. “Just before a pending attack, Leo would let me know and I would go out with a couple of guys and move two or three guard posts along the perimeter surrounding the supply base. That would send the VC back to the drawing board to replan their attack. During the year I was over there the base was never attacked by the enemy,” he said. However, Elliott and his troops weren’t as lucky when it came to the ships that brought fuel supplies to the area. Fuel was pumped from the holds of ships to a tank farm located at Camp McDermott. “When the fuel tankers came in and dropped anchor, we would go out and give them our spiel. We’d tell them they’d have to rig lights at the water line and have an armed guard walking the ship’s deck to keep saboteurs from swimming out and attaching an explosive charge to the side of the ship,” he said. One time a tanker filled with 13,000 tons of aviation fuel, gasoline and diesel fuel was badly damaged by a swimmer who managed to plant just such an explosive charge. Elliott had learned the secret of keeping the enemy away from the supply base, thanks to his CIA contact. Not everyone did. “We had a Special Forces unit nearby that didn’t believe in any of that stuff. They were a bunch of bad guys who lived in a compound,” he explained. “One night a VC unit crashed their gates, came through and blew up five of their helicopters and got away unscathed. “We did some good over there and we contributed to the war effort as long as it didn’t interfere with our lifestyle too much. However, it was a country club tour. We hit the beach almost every day. I wouldn’t have traded my job with anyone. This is why I don’t talk about my Vietnam tour around real combat veterans,” Elliott said. This story was first published in the Charlotte Sun newspaper, Port Charlotte, Florida on Monday, Aug. 31, 2009 and is republished with permission. Click here to view the collections in The Library of Congress Veterans History Project. Unfortunately Elliott’s wasn’t submitted as his interview was conducted long before Don started sending to the VHP. Hello sir, I’m very interested in the bronze bust. Excuse me, could you please sell it to me? He’s been approached numerous times and Mr. Elliot isn’t intersted in selling it.